For storage container rental in Portland OR, call Haulaway. We rent shipping containers out at a reasonable price and deliver them directly to your door, often in as little as one business day. We have a variety of sizes to choose from, to suit your unique needs. Our portable storage is available in the form of cargo containers, which are 8’ wide, and come in 20’ or 40’ length. All cargo containers feature our patented “Rhino Locking System” for the highest possible security, so you can rest easy knowing your property is safe. Beyond these cargo containers, we also rent the more mobile roll-off containers, which can be moved around your site for access from multiple locations, or for loading in one zone and unloading in another. These units come in the following lengths: 10’, 21’, and 26’. As with cargo containers, Haulaway doesn’t move the containers for you: we just deliver the container, and then you have control of it for the duration of your rental, whether it stays in one place or moves around your site. All shipping containers we rent have huge double doors at the end for ease of entry, and are ground level so there’s no difficult lifting to get your items into or out of the unit. 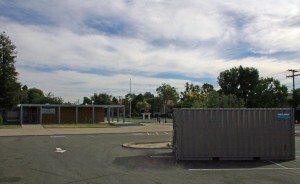 Haulaway’s storage container rental in Portland OR, is the perfect solution for all types of businesses. Professional construction companies love our storage, because it’s delivered quickly to wherever they need it and offers the highest quality containers for their job sites. Offices, schools, governments, and hospitals rely on Haulaway for their basic storage needs as well as when they’re undertaking a big project in their buildings. Our containers can be used as swing space for furniture or files while you’re remodeling one room of your office, without inconveniencing workers in another room! And residential customers love the convenience and simplicity of our rentals, because they can store furniture or construction materials and tools in one of our units while they’re remodeling their home. When you need extra space, think of Haulaway! Call us today for a free quote: 1-800-262-9040. You’ll also get a fast response if you choose to fill out a simple form on our website to get a quote. If you submit the form during normal business hours, we’ll get back to you within 15 minutes. That’s just one way we demonstrate our commitment to customer service. Another is in our affordability: we offer a wide selection of container sizes, so you can pay only for the storage you need.